In the market for a small crossover SUV to drive around Tampa? Look no further than the new Chevrolet Trax, on sale now at Cox Chevrolet. With an accessible price point, a size ideal for city driving without compromising cargo space, and available all-wheel drive, the Trax proves a strong option for any Sarasota driver. Head to the dealership to decide whether you want to buy or lease the new Chevrolet Trax! $2,099 off MSRP! Priced below KBB Fair Purchase Price! This 2019 Chevrolet Trax LS in Nightfall Gray Metallic is well equipped with: ECOTEC 1.4L I4 SMPI DOHC Turbocharged VVT, Emergency communication system: OnStar and Chevrolet connected services capable, Exterior Parking Camera Rear, Premium audio system: Chevrolet MyLink. 26/31 City/Highway MPG Included 2 Year Complimentary Basic Maintenance / In Business Over 90 years / Call 1-888-844-3454 For Details. %Off Offer includes price reduction below MSRP and Cash Allowance. On Select 2019 Chevrolet Vehicles. Not available with special finance, lease or other offers. Take new retail delivery by 04/30/19. GMF Down Payment Assistance. Cash usable only if financed through a supported or unsupported GMF contract. NOT Compatible with Standalone APR Program. Customer must qualify and finance with GM Financial. See participating dealer for details. %Off Offer includes price reduction below MSRP and Cash Allowance. On Select 2019 Chevrolet Vehicles. Not available with special finance, lease or other offers. Take new retail delivery by 04/30/19. GMF Down Payment Assistance. Cash usable only if financed through a supported or unsupported GMF contract. NOT Compatible with Standalone APR Program. Customer must qualify and finance with GM Financial. See participating dealer for details. $2,099 off MSRP! Priced below KBB Fair Purchase Price! This 2019 Chevrolet Trax LS in Silver Ice Metallic is well equipped with: ECOTEC 1.4L I4 SMPI DOHC Turbocharged VVT, 2 USB Ports w/Auxiliary Input Jack, Emergency communication system: OnStar and Chevrolet connected services capable, Exterior Parking Camera Rear, Premium audio system: Chevrolet MyLink. 26/31 City/Highway MPG Included 2 Year Complimentary Basic Maintenance / In Business Over 90 years / Call 1-888-844-3454 For Details. %Off Offer includes price reduction below MSRP and Cash Allowance. On Select 2019 Chevrolet Vehicles. Not available with special finance, lease or other offers. Take new retail delivery by 04/30/19. GMF Down Payment Assistance. Cash usable only if financed through a supported or unsupported GMF contract. NOT Compatible with Standalone APR Program. Customer must qualify and finance with GM Financial. See participating dealer for details. %Off Offer includes price reduction below MSRP and Cash Allowance. On Select 2019 Chevrolet Vehicles. Not available with special finance, lease or other offers. Take new retail delivery by 04/30/19. GMF Down Payment Assistance. Cash usable only if financed through a supported or unsupported GMF contract. NOT Compatible with Standalone APR Program. Customer must qualify and finance with GM Financial. See participating dealer for details. $2,099 off MSRP! Priced below KBB Fair Purchase Price! This 2019 Chevrolet Trax LS in Nightfall Gray Metallic is well equipped with: ECOTEC 1.4L I4 SMPI DOHC Turbocharged VVT, 2 USB Ports w/Auxiliary Input Jack, Emergency communication system: OnStar and Chevrolet connected services capable, Exterior Parking Camera Rear, Radio: Chevrolet Infotainment 3 System. 26/31 City/Highway MPG Included 2 Year Complimentary Basic Maintenance / In Business Over 90 years / Call 1-888-844-3454 For Details. %Off Offer includes price reduction below MSRP and Cash Allowance. On Select 2019 Chevrolet Vehicles. Not available with special finance, lease or other offers. Take new retail delivery by 04/30/19. GMF Down Payment Assistance. Cash usable only if financed through a supported or unsupported GMF contract. NOT Compatible with Standalone APR Program. Customer must qualify and finance with GM Financial. See participating dealer for details. %Off Offer includes price reduction below MSRP and Cash Allowance. On Select 2019 Chevrolet Vehicles. Not available with special finance, lease or other offers. Take new retail delivery by 04/30/19. GMF Down Payment Assistance. Cash usable only if financed through a supported or unsupported GMF contract. NOT Compatible with Standalone APR Program. Customer must qualify and finance with GM Financial. See participating dealer for details. $2,099 off MSRP! Priced below KBB Fair Purchase Price! This 2019 Chevrolet Trax LS in Mosaic Black Metallic is well equipped with: ECOTEC 1.4L I4 SMPI DOHC Turbocharged VVT, 2 USB Ports w/Auxiliary Input Jack, Emergency communication system: OnStar and Chevrolet connected services capable, Exterior Parking Camera Rear, Premium audio system: Chevrolet MyLink. 26/31 City/Highway MPG Included 2 Year Complimentary Basic Maintenance / In Business Over 90 years / Call 1-888-844-3454 For Details. %Off Offer includes price reduction below MSRP and Cash Allowance. On Select 2019 Chevrolet Vehicles. Not available with special finance, lease or other offers. Take new retail delivery by 04/30/19. GMF Down Payment Assistance. Cash usable only if financed through a supported or unsupported GMF contract. NOT Compatible with Standalone APR Program. Customer must qualify and finance with GM Financial. See participating dealer for details. %Off Offer includes price reduction below MSRP and Cash Allowance. On Select 2019 Chevrolet Vehicles. Not available with special finance, lease or other offers. Take new retail delivery by 04/30/19. GMF Down Payment Assistance. Cash usable only if financed through a supported or unsupported GMF contract. NOT Compatible with Standalone APR Program. Customer must qualify and finance with GM Financial. See participating dealer for details. $2,099 off MSRP! Priced below KBB Fair Purchase Price! This 2019 Chevrolet Trax LS in Nightfall Gray Metallic is well equipped with: ECOTEC 1.4L I4 SMPI DOHC Turbocharged VVT, 2 USB Ports w/Auxiliary Input Jack, Emergency communication system: OnStar and Chevrolet connected services capable, Exterior Parking Camera Rear, Premium audio system: Chevrolet MyLink. 26/31 City/Highway MPG Included 2 Year Complimentary Basic Maintenance / In Business Over 90 years / Call 1-888-844-3454 For Details. %Off Offer includes price reduction below MSRP and Cash Allowance. On Select 2019 Chevrolet Vehicles. Not available with special finance, lease or other offers. Take new retail delivery by 04/30/19. GMF Down Payment Assistance. Cash usable only if financed through a supported or unsupported GMF contract. NOT Compatible with Standalone APR Program. Customer must qualify and finance with GM Financial. See participating dealer for details. %Off Offer includes price reduction below MSRP and Cash Allowance. On Select 2019 Chevrolet Vehicles. Not available with special finance, lease or other offers. Take new retail delivery by 04/30/19. GMF Down Payment Assistance. Cash usable only if financed through a supported or unsupported GMF contract. NOT Compatible with Standalone APR Program. Customer must qualify and finance with GM Financial. See participating dealer for details. $2,099 off MSRP! Priced below KBB Fair Purchase Price! This 2019 Chevrolet Trax LS in Summit White is well equipped with: ECOTEC 1.4L I4 SMPI DOHC Turbocharged VVT, 2 USB Ports w/Auxiliary Input Jack, Emergency communication system: OnStar and Chevrolet connected services capable, Exterior Parking Camera Rear, Premium audio system: Chevrolet MyLink. 26/31 City/Highway MPG Included 2 Year Complimentary Basic Maintenance / In Business Over 90 years / Call 1-888-844-3454 For Details. %Off Offer includes price reduction below MSRP and Cash Allowance. On Select 2019 Chevrolet Vehicles. Not available with special finance, lease or other offers. Take new retail delivery by 04/30/19. GMF Down Payment Assistance. Cash usable only if financed through a supported or unsupported GMF contract. NOT Compatible with Standalone APR Program. Customer must qualify and finance with GM Financial. See participating dealer for details. %Off Offer includes price reduction below MSRP and Cash Allowance. On Select 2019 Chevrolet Vehicles. Not available with special finance, lease or other offers. Take new retail delivery by 04/30/19. GMF Down Payment Assistance. Cash usable only if financed through a supported or unsupported GMF contract. NOT Compatible with Standalone APR Program. Customer must qualify and finance with GM Financial. See participating dealer for details. $2,099 off MSRP! Priced below KBB Fair Purchase Price! This 2019 Chevrolet Trax LS in Mosaic Black is well equipped with: ECOTEC 1.4L I4 SMPI DOHC Turbocharged VVT, 2 USB Ports w/Auxiliary Input Jack, Emergency communication system: OnStar and Chevrolet connected services capable, Exterior Parking Camera Rear, Premium audio system: Chevrolet MyLink. 26/31 City/Highway MPG Included 2 Year Complimentary Basic Maintenance / In Business Over 90 years / Call 1-888-844-3454 For Details. %Off Offer includes price reduction below MSRP and Cash Allowance. On Select 2019 Chevrolet Vehicles. Not available with special finance, lease or other offers. Take new retail delivery by 04/30/19. GMF Down Payment Assistance. Cash usable only if financed through a supported or unsupported GMF contract. NOT Compatible with Standalone APR Program. Customer must qualify and finance with GM Financial. See participating dealer for details. %Off Offer includes price reduction below MSRP and Cash Allowance. On Select 2019 Chevrolet Vehicles. Not available with special finance, lease or other offers. Take new retail delivery by 04/30/19. GMF Down Payment Assistance. Cash usable only if financed through a supported or unsupported GMF contract. NOT Compatible with Standalone APR Program. Customer must qualify and finance with GM Financial. See participating dealer for details. $4,162 off MSRP! Priced below KBB Fair Purchase Price! This 2019 Chevrolet Trax LT in Mosaic Black Metallic is well equipped with: ECOTEC 1.4L I4 SMPI DOHC Turbocharged VVT, 2 Spare Keys Key System, 3-Spoke Leather-Wrapped Steering Wheel, 6-Way Power Driver Seat Adjuster, Body-Color Door Handles w/Chrome Accent, Deluxe Cloth/Leatherette Seat Trim, Keyless Open w/Panic Alarm, Keyless Start, LT Convenience Package, SiriusXM Radio. 26/31 City/Highway MPG Included 2 Year Complimentary Basic Maintenance / In Business Over 90 years / Call 1-888-844-3454 For Details. %Off Offer includes price reduction below MSRP and Cash Allowance. On Select 2019 Chevrolet Vehicles. Not available with special finance, lease or other offers. Take new retail delivery by 04/30/19. GMF Down Payment Assistance. Cash usable only if financed through a supported or unsupported GMF contract. NOT Compatible with Standalone APR Program. Customer must qualify and finance with GM Financial. See participating dealer for details. %Off Offer includes price reduction below MSRP and Cash Allowance. On Select 2019 Chevrolet Vehicles. Not available with special finance, lease or other offers. Take new retail delivery by 04/30/19. GMF Down Payment Assistance. Cash usable only if financed through a supported or unsupported GMF contract. NOT Compatible with Standalone APR Program. Customer must qualify and finance with GM Financial. See participating dealer for details. %Off Offer includes price reduction below MSRP and Cash Allowance. On Select 2019 Chevrolet Vehicles. Not available with special finance, lease or other offers. Take new retail delivery by 04/30/19. GMF Down Payment Assistance. Cash usable only if financed through a supported or unsupported GMF contract. NOT Compatible with Standalone APR Program. Customer must qualify and finance with GM Financial. See participating dealer for details. $4,162 off MSRP! Priced below KBB Fair Purchase Price! This 2019 Chevrolet Trax LT in Mosaic Black Metallic is well equipped with: ECOTEC 1.4L I4 SMPI DOHC Turbocharged VVT, 2 Spare Keys Key System, 3-Spoke Leather-Wrapped Steering Wheel, 6-Way Power Driver Seat Adjuster, Body-Color Door Handles w/Chrome Accent, Deluxe Cloth/Leatherette Seat Trim, Keyless Open w/Panic Alarm, Keyless Start, LT Convenience Package. 26/31 City/Highway MPG Included 2 Year Complimentary Basic Maintenance / In Business Over 90 years / Call 1-888-844-3454 For Details. %Off Offer includes price reduction below MSRP and Cash Allowance. On Select 2019 Chevrolet Vehicles. Not available with special finance, lease or other offers. Take new retail delivery by 04/30/19. GMF Down Payment Assistance. Cash usable only if financed through a supported or unsupported GMF contract. NOT Compatible with Standalone APR Program. Customer must qualify and finance with GM Financial. See participating dealer for details. %Off Offer includes price reduction below MSRP and Cash Allowance. On Select 2019 Chevrolet Vehicles. Not available with special finance, lease or other offers. Take new retail delivery by 04/30/19. GMF Down Payment Assistance. Cash usable only if financed through a supported or unsupported GMF contract. NOT Compatible with Standalone APR Program. Customer must qualify and finance with GM Financial. See participating dealer for details. %Off Offer includes price reduction below MSRP and Cash Allowance. On Select 2019 Chevrolet Vehicles. Not available with special finance, lease or other offers. Take new retail delivery by 04/30/19. GMF Down Payment Assistance. Cash usable only if financed through a supported or unsupported GMF contract. NOT Compatible with Standalone APR Program. Customer must qualify and finance with GM Financial. See participating dealer for details. $4,255 off MSRP! Priced below KBB Fair Purchase Price! This 2019 Chevrolet Trax LT in Summit White is well equipped with: ECOTEC 1.4L I4 SMPI DOHC Turbocharged VVT, 2 Spare Keys Key System, 3-Spoke Leather-Wrapped Steering Wheel, 6-Way Power Driver Seat Adjuster, Body-Color Door Handles w/Chrome Accent, Deluxe Cloth/Leatherette Seat Trim, Driver Confidence Package, Emergency communication system: OnStar and Chevrolet connected services capable, Exterior Parking Camera Rear, Keyless Open w/Panic Alarm, Keyless Start, LT Convenience Package, Rear Cross-Traffic Alert, Rear Park Assist w/Sensor Indicator, Side Blind Zone Alert, SiriusXM Radio. 26/31 City/Highway MPG Included 2 Year Complimentary Basic Maintenance / In Business Over 90 years / Call 1-888-844-3454 For Details. %Off Offer includes price reduction below MSRP and Cash Allowance. On Select 2019 Chevrolet Vehicles. Not available with special finance, lease or other offers. Take new retail delivery by 04/30/19. GMF Down Payment Assistance. Cash usable only if financed through a supported or unsupported GMF contract. NOT Compatible with Standalone APR Program. Customer must qualify and finance with GM Financial. See participating dealer for details. %Off Offer includes price reduction below MSRP and Cash Allowance. On Select 2019 Chevrolet Vehicles. Not available with special finance, lease or other offers. Take new retail delivery by 04/30/19. GMF Down Payment Assistance. Cash usable only if financed through a supported or unsupported GMF contract. NOT Compatible with Standalone APR Program. Customer must qualify and finance with GM Financial. See participating dealer for details. %Off Offer includes price reduction below MSRP and Cash Allowance. On Select 2019 Chevrolet Vehicles. Not available with special finance, lease or other offers. Take new retail delivery by 04/30/19. GMF Down Payment Assistance. Cash usable only if financed through a supported or unsupported GMF contract. NOT Compatible with Standalone APR Program. Customer must qualify and finance with GM Financial. See participating dealer for details. $4,195 off MSRP! Priced below KBB Fair Purchase Price! This 2019 Chevrolet Trax LT in Dark Copper Metallic is well equipped with: ECOTEC 1.4L I4 SMPI DOHC Turbocharged VVT, 2 Spare Keys Key System, 2 USB Ports w/Auxiliary Input Jack, 3-Spoke Leather-Wrapped Steering Wheel, 6-Way Power Driver Seat Adjuster, Body-Color Door Handles w/Chrome Accent, Deluxe Cloth/Leatherette Seat Trim, Driver Confidence Package, Keyless Open w/Panic Alarm, Keyless Start, LT Convenience Package, Rear Cross-Traffic Alert, Rear Park Assist w/Sensor Indicator, Side Blind Zone Alert. 26/31 City/Highway MPG Included 2 Year Complimentary Basic Maintenance / In Business Over 90 years / Call 1-888-844-3454 For Details. %Off Offer includes price reduction below MSRP and Cash Allowance. On Select 2019 Chevrolet Vehicles. Not available with special finance, lease or other offers. Take new retail delivery by 04/30/19. GMF Down Payment Assistance. Cash usable only if financed through a supported or unsupported GMF contract. NOT Compatible with Standalone APR Program. Customer must qualify and finance with GM Financial. See participating dealer for details. %Off Offer includes price reduction below MSRP and Cash Allowance. On Select 2019 Chevrolet Vehicles. Not available with special finance, lease or other offers. Take new retail delivery by 04/30/19. GMF Down Payment Assistance. Cash usable only if financed through a supported or unsupported GMF contract. NOT Compatible with Standalone APR Program. Customer must qualify and finance with GM Financial. See participating dealer for details. %Off Offer includes price reduction below MSRP and Cash Allowance. On Select 2019 Chevrolet Vehicles. Not available with special finance, lease or other offers. Take new retail delivery by 04/30/19. GMF Down Payment Assistance. Cash usable only if financed through a supported or unsupported GMF contract. NOT Compatible with Standalone APR Program. Customer must qualify and finance with GM Financial. See participating dealer for details. 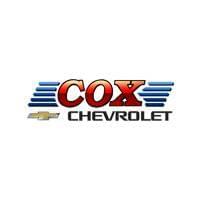 Learn More About the Chevrolet Trax with Cox Chevy!